Some of this collection in stock. Order in the next 11 hours, 59 minutes and it will go out today! Magic Dave (Dave Allen) has got to be without a doubt one of the busiest children's entertainers in the UK. In 2004, Magic Dave won the coveted United Kingdoms Children's Entertainer of the year award in Blackpool, just two years after turning professional. So how does he do it? How can a children's entertainer get to be so successful, and so busy in such a short time? Now YOU can find out just how magic Dave does it. In 2004, Magic Dave won the coveted United Kingdom's Children's Entertainer of the Year award in Blackpool, just two years after turning professional. So how does he do it? How can a children's entertainer achieve such success and become so in-demand in such a short time? This DVD shares the secret to his success. 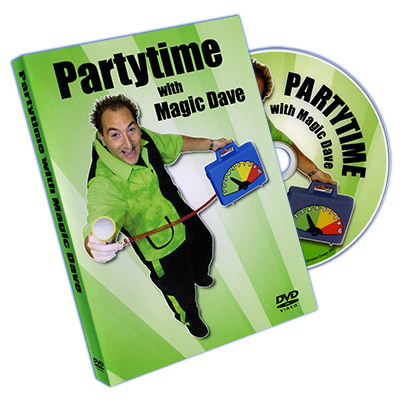 You have been invited to join Magic Dave at one of his most popular party packages a full two-hour party. Watch and learn from this DVD as he takes you completely through the entire party. You will see how it is run, from the true moment Dave arrives at the venue all the way to the end of the party. There is a very rare chance to see a top professional children's entertainer work in real time. All the laughs, all the gags, all the games, all the magic and all the fun. This DVD will teach and inspire you to become a better children's entertainer, so sit down, and relax and let the party begin. In 2009 Magic Dave won the title of British Isles Children's Entertainer of the Year. This DVD features all new games, magic and fun. Join Magic Dave once again in his brand new, full 2 hour party. You will find that EVERYTHING on this DVD is new and original from Partytime 1. The Green Monster Game, the hilarious Daisy the cow puppet routine, The Mega Quiz, and a stunning levitation of the birthday girl, plus LOADS more crammed into this 2 Hour Party. Enjoy!